As of the past (nearly) two years, we have been balancing our world travel with building a domestic base, or as we like to call it, homestead. When we aren’t trekking around the planet (across continents or across county lines), we are cultivating a food forest in our yard, with the aim of growing more and more (and more) of the food we eat. In part this is to counterbalance the energy we consume and spread of our footprints when we travel, and in part because it’s just fun and rewarding. 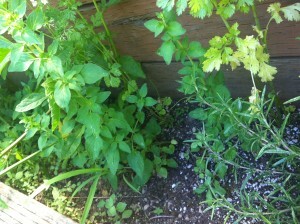 Epazote, oregano, cilantro and rosemary getting friendly in a planter box. The grass wasn’t invited to the party but can hang out too. 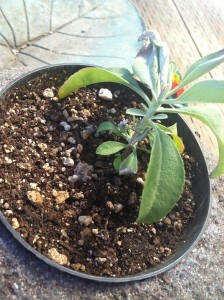 Baby sage in a container on the porch. 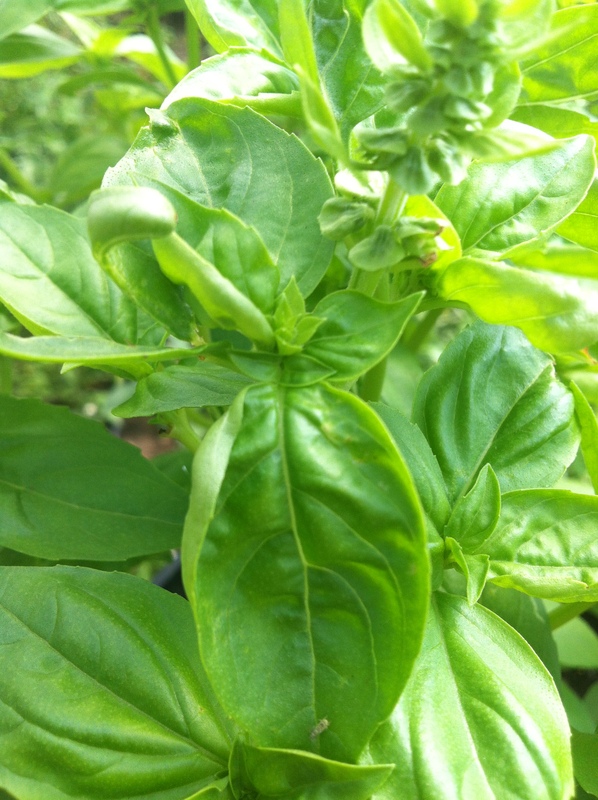 Some basil luxuriating in the greenhouse. One thing I’ve been really extra into this summer is growing and drying my own herbs and spices. Because such things typically aren’t prohibitively expensive to purchase, you may ask why it’s worth the bother to grow and preserve your own. My answer to that is that it’s hardly any bother at all! 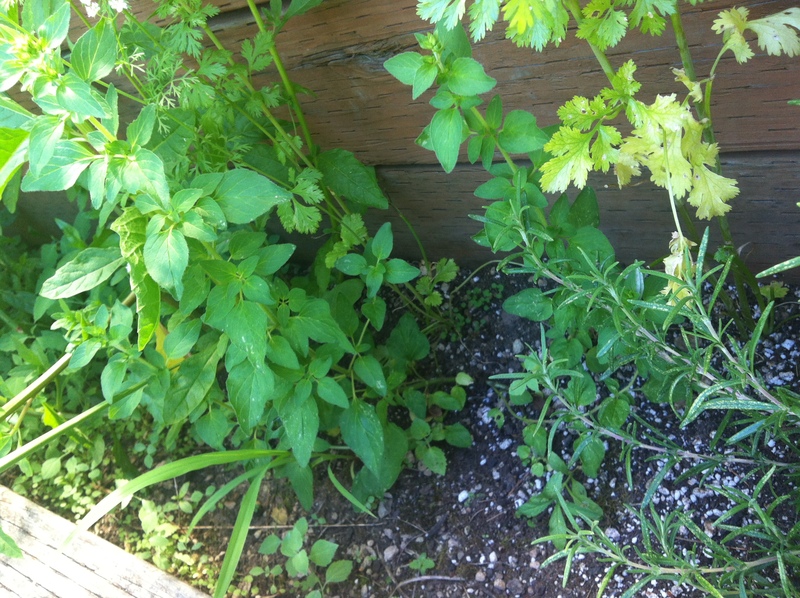 Here in Oregon I have oregano, rosemary, lavender, thyme, cilantro, epazote, basil, chives, chamomile, marjoram, cayenne pepper and more going like gangbusters, and a lot of it (PARSLEY!) I didn’t even plant on purpose! I realize every single day that I’m lucky to have the available space and climatic affability that enables me to do this on a slightly larger scale, but remember that many herbs will live happily in window box planters, in containers on the front stoop of your apartment, or simply in little pots on your desk by a window, on your kitchen counter by a window, above your sink in a window…anywhere in or around your house where they can get as much natural light as your situation will allow. Toss it in a bag. Seriously. 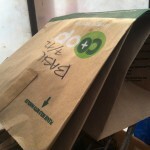 All you do is toss it in a bag. that spaghetti sauce you’re going to make sometime in February? 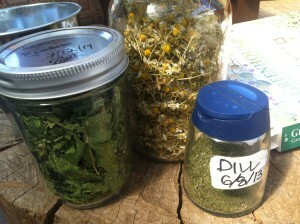 In the summer, drying herbs for future enjoyment is easy, with no special equipment required! If you have a dehydrator of course you can use it at any time, but even though my Excalibur is cranking away on other projects all summer, I don’t even need it to dry my savory harvest. 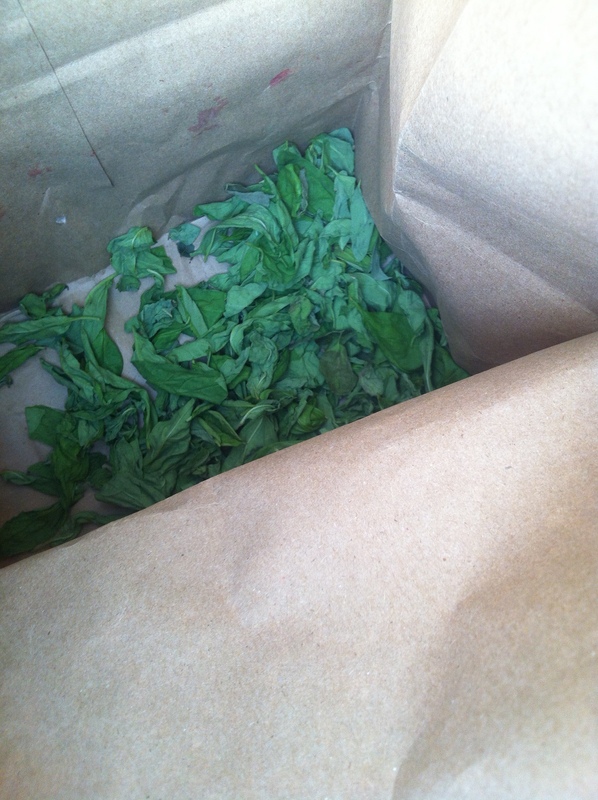 I simply put the cut leaves in a paper grocery bag, fold over the top, and put it in the warmest, driest place available to me. For me this is inside my greenhouse, but if you don’t have one you might have an attic, a closet, a covered back porch, a shed, a garage, a bedroom that’s way to hot to sleep in right now, etc. 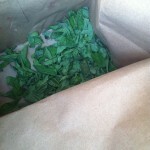 Really, your herbs will dry out in a paper sack anywhere (even a basement!) eventually, the process will just be faster the warmer and drier the environment. 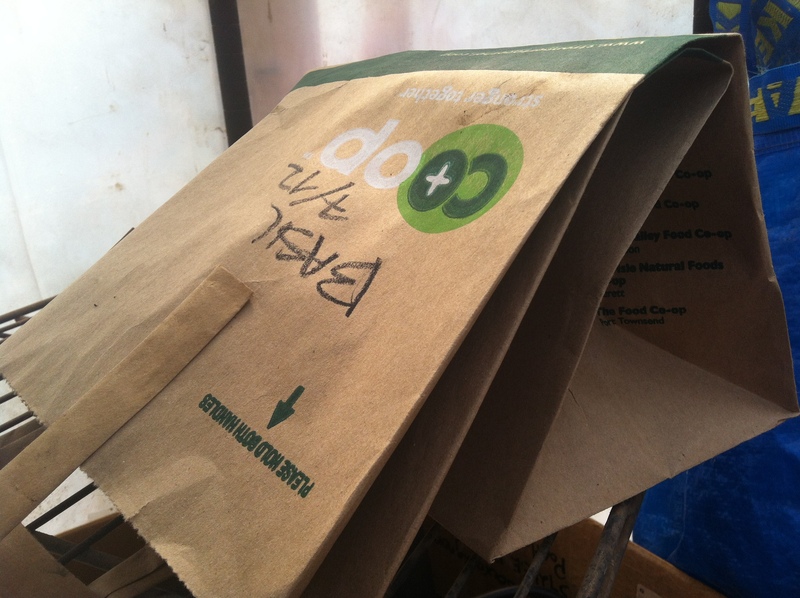 The key is just to check on the sack every couple of days and give it a good shake to keep the goods mobile and keep moisture from getting stuck inside. Once dry simply keep in a jar and use all year long! Epazote, chamomile and dill, all good to go! I believe that anything you can do to empower yourself to become more directly connected to your food, however small, has radical implications for your sense of self-sufficiency and cumulative reduction of resources. For those of us who travel a lot it is difficult to reconcile the strain we put on natural resources by flying in planes and consuming a lot more disposable items than we are comfortable with. For me, even though I know that buying one less jar of dried basil in a year is really a negligible contribution on the grand scale, to me it’s worth it to bring myself one centimeter closer to my own sustenance. And as someone who gets a huge kick out of the experience of regionally specific foods, it is rewarding to cultivate regionally specific food of my own! I enjoy a very special sense of comfort and personal accomplishment when I open a jar in the depths of winter to taste the summer sunshine–from the same sun that feeds mangoes in Central America, kaffir limes in Southeast Asia and oranges in Italy–captured in a glass, long after it did its dance across my own backyard. This entry was posted on July 23, 2014 by sadie in Uncategorized and tagged garden, herbs, home.